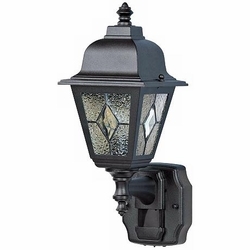 This classic, cottage-style outdoor light comes loaded with features, like a built-in motion sensor. This stylish outside wall lamp offers great looks, plus the convenience of a built-in motion sensor. A handy security feature around garages and patios, the motion detector has a 180 degree, 30 foot range. Refinement, elegance and romance --- that's what will stand out on your wall. • Die cast aluminum construction. • Includes manual override feature. • California Title 24 compliant. • Extends 8 3/8" from the wall.